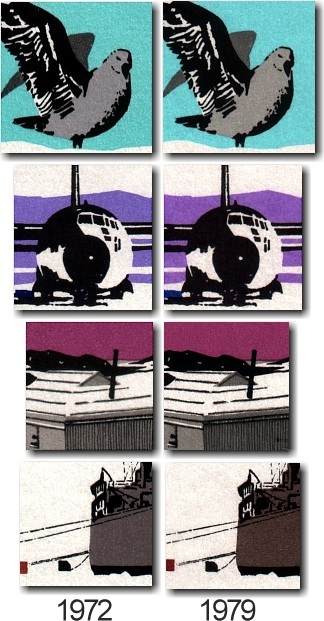 This issue replaced the 1967 Ross Dependency Decimal Pictorials as the new definitive set and remained in circulation until the 1982 Ross Dependency 25th Anniversary of Scott Base stamps were issued. Although not a commemorative issue, the stamps were issued on the 60th Anniversary of Scott's Polar Party reaching the South Pole on January 18th, 1912. In January 1979 a new printing of the same designs on new plates was issued on thinner white chalky paper with a PVA surface adhesive which appears dull compared to the shiny Gum Arabic used on the original stamps. The colours used are also slightly different - most notably on the four and eight cent stamps - and the paper used in the first printing is cream coloured when compared against the 1979 printing.